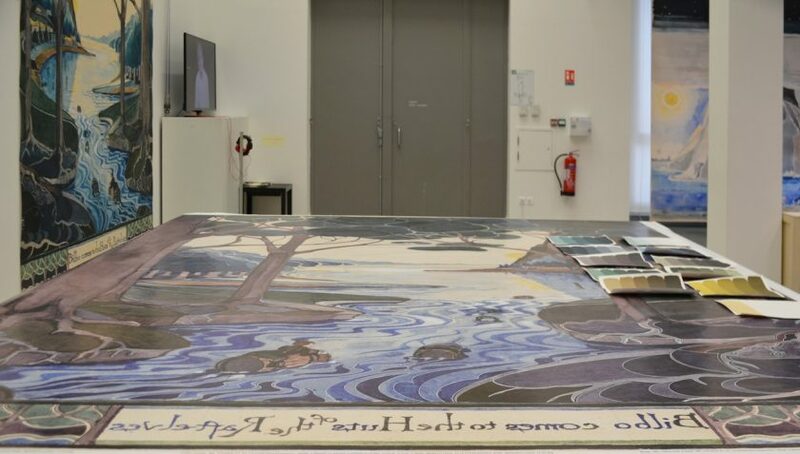 In late 2016, an agreement was made between the Tolkien Estate and the Tapestry Museum in Aubusson to produce thirteen tapestries and one carpet over the following four years. Aubusson tapestries are recognised as UNESCO cultural heritage, and Tolkien’s inclusion acknowledges Tolkien as much as an artist as an author, and connects his works with tapestries as was the case with many authors in centuries gone by. The 14 images were chosen in consultation with the Tolkien family, and cover The Hobbit, The Lord of the Rings and The Silmarillion. Each tapestry will be displayed once it is completed, and visitors to Aubusson will be able to witness the process as the tapestries are being made. 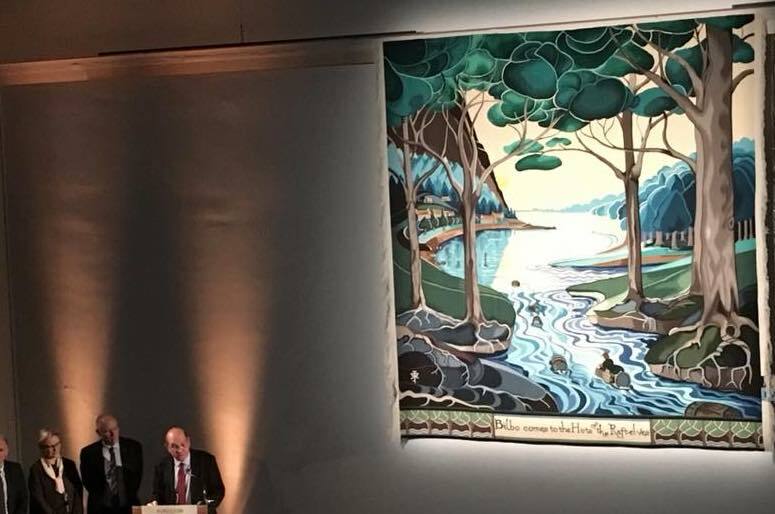 The first completed tapestry “Bilbo comes to the Huts of the Raft Elves” was revealed at a special event on 6 April 2018. Baillie Tolkien, the wife of Christopher, was the guest of honour, where she was asked to begin to cut the tapestry off the loom. She made a speech in French and was clearly very impressed with the workmanship and declared that her father-in-law would have loved it. The second tapestry “Taniquetil” should be completed towards the end of September. You may read about the original concept here, and see videos (in French) taken during the ceremony on 6 April 2018, which may be viewed on the Aubusson Tapestries Facebook page.